Even on a dark and chilling early Tuesday morning Febuary 9th 2010, The Peach Arch Park grew to a crowd of thousands with Men, Women, Children & their Families. The heavy dew, fog and shadows filled the air, but soon with the warmth and excitement of seeing a historical event filled the air with cheers and song "Oh Canada" from the crowd to which this day was filled with sunshine and Spirit. We were all about to witness the Winter Olympic Torch cross an International border for the first time ever into the United States of America and the first time to cross a border since Iceland. The Olympic Torch was lit and left Ancient Olympia, Greece on Oct. 22nd, 2009. After stopping in Iceland, then en route to Victoria, B.C. where the relay journey started across Canada on Oct. 30th. 2009. This will cover over 45,000 kilometers over 106 days ending in Vancouver for the opening ceremonies Febuary 12th, 2010. 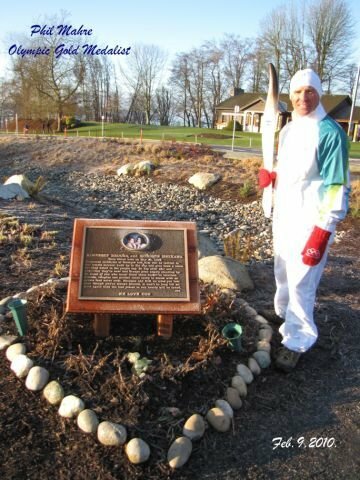 The first Canadian Olympic Torchbearer at Peace Arch Park was Rayne Williams (First Nations) she lit the U.S. downhill skiing Olympic Gold medalist Phil Mahre's torch, he crossed through the landmark Peach Arch that Unites Canada and the U.S with thunderous cheers from the anticipating and joyous crowd. The ceremony platform involved many dignitaries to name a few such as Surrey Mayor Dianne Watts, B.C.Premier Gordon Campbell, Washington Governor Christine Gregoire and The Semiahmoo First Nations. During the ceremony, Governor Christine Gregoire stated, "This is a beautiful place to celebrate the spirit of the Olympics." During the ceremony the Olympic Peace Arch cauldron was lit by the Olympian Phil Mahre then after the platform ceremony both the Olympic Torches were lit once again as Canadian torchbearer Chamila Anthonypillai with her Olympic torch glowing brightly continued the torch relay bound for Richmond B.C. U.S. Olympic Gold Medalist Phil Mahre kindly stopped at Kim Brooks and Monique Ishikawa's Memorial Plaque, which was also a first! For the Olympic Torch ... I could feel the girls smiling in the skys. It was a Glorious day! Go Canada Go! A studio version of this recording is in the works - stay tuned. 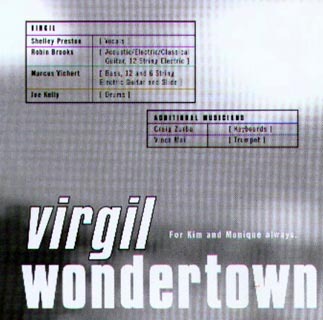 released their CD Wondertown, dedicated to Kim and Monique. 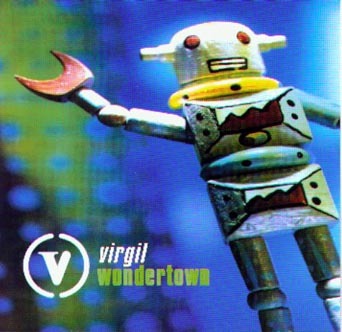 There is a website for the CD at http://www.indiepool.com/virgil/index.html. Monique was always sincere in sharing her feelings when we would go to church on Sundays. Her favorite saying was, "Grandma, I feel so good coming to your church. I love it here." 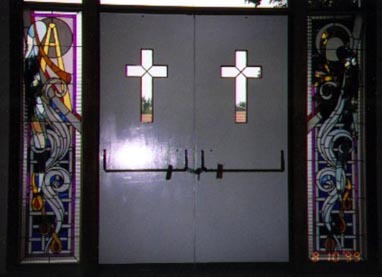 When our precious Monique could no longer come, we decided to have the beautiful stained glass windows installed in our church in memory of her visits. We had a deeply moving dedication of the windows with many friends present. Our precious grandaughter is always in our hearts and in our thoughts. On August 2nd, 2000, British Columbia's provincial auto insurance company commemorated all the people who had been killed on the roads of the province. All these people were portrayed as stars in their communities, and thus the day was called Communities Touched By Stars. 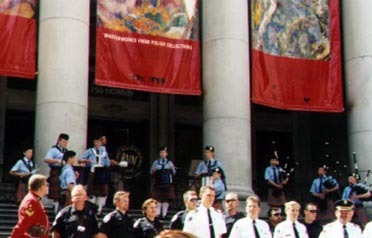 The Vancouver event was held outside the Vancouver Art Gallery, previously the city's court house and traditionally the site of public events. It was organized by ICBC youth workers, and attended by police, firemen, rescue workers, families of victims of car accidents and people walking by on the busy downtown street. "Whereas hundreds of lives are lost on our roads every year in fatal vehicle crashes, and whereas, on BC Day long weekend, more people are injured or die in traffic fatalities than at any other time of the year, and whereas the city of Vancouver and ICBC recognize the need to work together to help reduce the number of fatalities, and whereas an annual day of rememberance before the BC Day long weekend will acknoledge those who have died and help raise awareness of this issue, particularly of the risk to young drivers, now therefore I, Lynn Kennedy, for Philip Owen, mayor of the city of Vancouver, do hereby proclaim Wednesday, August 2nd, 2000 as Communities Touched By Stars, the first annual day of rememberance for those who have died on our roads, hereby proclaimed in the city of Vancouver." The next speaker was Sherry Caves, president of Mothers Against Drunk Driving, Greater Vancouver Chapter. Sherry has been in a wheel chair since being hit by a drunk driver at the age of seven, and spoke about her difficult life. After her speech, the band played a song written for this event, "Touched by the Stars." "We are the only species we know of that know we're gonna die. So, we spend most of our lives and our great intellects denying it, sweeping death under the rug. My daughter Monique spent her first ten years, half her life, in Japan - where the dead remain part of the daily lives of the living. Daily ceremonies of respect...a respect and understanding that we live in a world created from the labours and loves of those who came before us. Now and then are in continuous conversation. At 3 AM on May 31st, 1998, two police women appeared at our door, and informed us that our daughter was dead. When we said we couldn't believe it, we were told that, "people die every day on the news. It has to be somebody." If Monique and her friend Kim Brooks had been killed a few meters to the south, on the other side of the Peace Arch, their killer would likely now be in jail, or a mental institution. In Canada, justice remains an alien concept. Our daily dead are but tear-jerker filler between commercials. "On our way home tonight, we got in an accident on Hastings and Renfrew. A small accident and luckily nobody was hurt. It was some drunk lady that shouldn't have been driving that hit us. We were in Kim's car." On May 30th, Kim and Monique's luck ran out. We trust to luck that some dangerous driver won't end our lives, but as a society with no viable legal deterrent to vehicular homicide, we're playing a game of - let's call it - Canadian Roulette. We must treasure the dead, not in our cemeteries, but in our laws. Justice won't suddenly arrive on a UFO. We have to will it into existence ourselves, before Our luck runs out." Courtney Wilson spoke of being one of seventeen people injured by a drunk driver after a school party. Two of the seventeen, including Courtney's best friend Heidi Klompas, were killed. Finally, Lianna Martin spoke of the accident that killed her brother, Murray Gus. The Robert Malcolm Memorial Pipe Band played Amazing Grace. The band was named after two of its members who were killed in a car accident. The final speech was by ICBC youth representative Garrick Ng, who was also the M.C, for the event. He addressed the fact that car accidents are the leading cause of death among BC youth. There was a moment of silence. The band played "What a Wonderful World." Seedlings were given out to those in attendance, to plant in memory of their loved ones. Canada now allows personalized postage stamps. 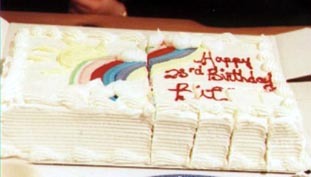 We had this made for Monique's birthday, Oct. 25, 2000. 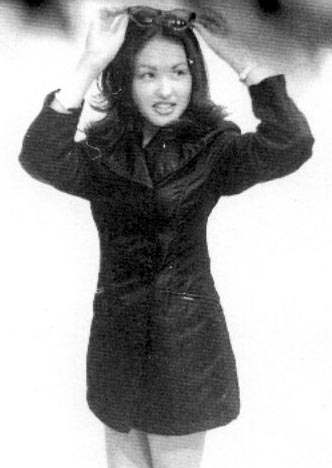 Monique Ishikawa celebrated her 23rd birthday on Oct. 25th, 2001. The occasion was wondrously choreographed by Mo's friend Steph, just back from her honeymoon. Mo's design ideas for Steph's husband James' new club were never far from their conversation. Dino glowed, as usual. Their Bit Enterprises had just opened it's 3rd store, and her dream of a Chateau Monique line of clothing swam ever closer into view. Back in Japan to live last year, after several short visits, she realized her childhood home and its surrounding memories were beyond recovering from the new model Kamagaya, and its mystery of new construction. It wasn't 1980s Kamagaya anymore. Her friends had moved on, into new families of their own. When her first TV ad appeared, she was amazed at how everyone she had ever known in Kamagaya seemed to be able to find her, after her strange lack of success in trying to find them.. It was the right decision, going to Japan to seek some form of publicity for her skills rather than going on to SFU after her two years at Cap College . As her mother had always told her, Japan was yet another possibility for her to succeed in. Success had come quickly. It was great to see Kim at her 23rd birthday party. Kim was so busy with law school, she never had time to hang out anymore; something Mo had so coveted during her year in Japan. Mo's Vancouver friends remained sustenance to her. Her childhood friends in Japan had become "gaijin," aliens to her, as was the country, for all its appreciation of her, for all its new cute things. She could thrive on its myriad opportunities, but her priorities fluttered discordantly. A butterfly of indecision births a typhoon in another universe. The night her first TV commercial was broadcast she had a nightmare. She was approaching the Peace Arch border crossing from the States with Kim when they were struck by another car and blown up. The image of them being cremated alive was broadcast on TV endlessly, in her dream. It so terrified her that she called Kim, disturbing her from study for a crucial exam, to verify that Kim was still alive. The dream so troubled her, she leapt off the career she had so carefully crafted in her year in Tokyo, afraid of ever seeing herself on TV again, and fled back to Vancouver. Her friends were as delighted to see her as she was to see them again. She looks forward to returning to Japan when the time came, to model her Chateau Monique fashions, and fill their tiny closets with her vast imaginings, but first it’s time to savour the comfort of those that clustered around her, warming the atoms of celebration of her 23rd birthday. For Monique, still on the dream side of cremation, it was a good day. Fumiyo, Pushpa, Howie, Mirza, Steph, Dino, Mr.Steph, Lara, Hartly, Jenn and Indra celebrate Bit's 23rd Birthday as Cat takes pictures.